Typical toddlers simultaneously spend about three hours a day in physical activity, play, and engagement with objects such as toys, while their peers with mobility disabilities are less likely to engage in all of those behaviors, research from Oregon State University (OSU) shows. According to Sam Logan, PhD, the study underscores the need for young children with disabilities to have opportunities to play and explore in the same manner as their peers. “Whatever typically developing kids do should be the gold standard for all children, including those with disabilities,” said Logan, an assistant professor of kinesiology in the College of Public Health and Human Sciences. Research has shown that independent mobility is linked to cognitive, social, motor, language, and other developmental benefits in young children. Being pushed in a stroller or being carried from one place to another is fundamentally different from having active control over one’s own exploration, which is where the developmental gains are seen, he said. The researchers found that typically developing toddlers spent about an hour per day in direct play interactions with their peers, while toddlers with disabilities that impair mobility spent less than 20 minutes and as few as six minutes per day in similar interactions. One challenge is the lack of commercially available devices to help toddlers with mobility issues to get around on their own, Logan said. Some low-cost interventions are emerging to help address this issue. Logan is a leader of the Go Baby Go program, which provides children who have movement disabilities with modified ride-on toy cars. 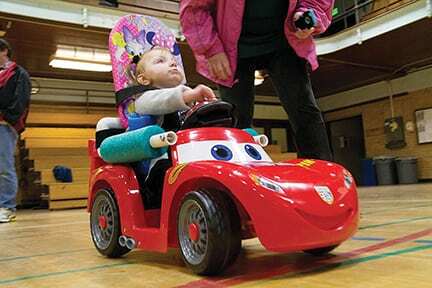 The cars give children independence at a much younger age, allowing them the mobility needed to increase their interaction with peers and other objects, Logan said. For more information, visit www.youtube.com/watch?v=U-NE7B0RTdA or type “Go Baby Go modified cars” into your Internet search engine. This article was adapted from information provided by OSU.